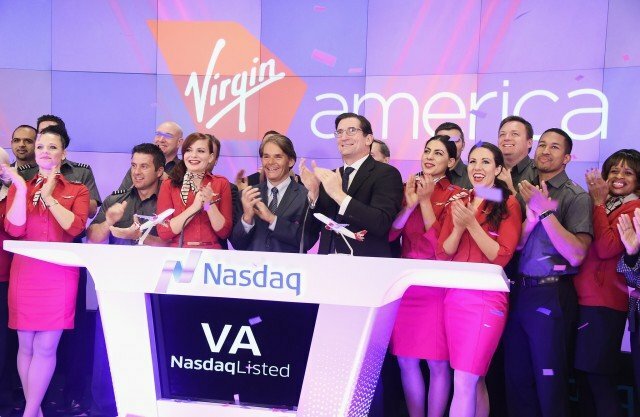 Virgin America airline shares surged more than 30% in the first day of trading on the NASDAQ stock exchange in New York. Richard Branson owns nearly 25% of Virgin America, which is an offshoot of his London-based Virgin Group. Virgin America started flying in 2007, and after several years of losing money, finally became profitable last year. It reported profits of $10.2 million on revenue of $1.42 billion in 2013. Virgin America sold 13.3 million shares that were initially priced at $23, raising about $307 million for the company. The airline primarily operates long haul flights within the US, such as from New York to Los Angeles. With a fleet of 53 planes within the US and Mexico, Virgin America is known for its flashy amenities, including mood lighting and wireless internet. However, the airline offers fewer destinations than some of its competitors, and consequently carries only a fraction of the total passengers of rivals such as Southwest. Overall, US airlines are flying high, as lower oil prices have recently led to an increase in profits. The US recovery has also led consumers to purchase more airline tickets, keeping planes full. One index of airline stocks hit a 13-year high recently, and analysts expect that upward flight path to continue.